Major Geoffrey Douglas Langlands’s brief posting turned into more than seven decades in Pakistan, during which he left the army to become one of the country’s most revered teachers. Islamabad: A former British officer who arrived in Pakistan with the Raj and stayed to become one of its most famous educators, with students including Prime Minister Imran Khan, has died in Lahore aged 101, officials said Wednesday. But his brief posting turned into more than seven decades in Pakistan, during which he left the army to become one of the country’s most revered teachers. Profiled repeatedly in the British press, which documented among other things his daily breakfast of porridge, a poached egg and two cups of Lipton’s tea, he finally retired in northwestern Chitral in 2012 at the age of 94. “Aitchison College mourns the passing of Major Geoffrey Douglas Langlands, who left us quietly on Wednesday after a brief illness,” the institution announced on its official website. “Born on October 21, 1917 and affectionately known to all as ‘The Major’, we acknowledge the life of a soldier, teacher, gentleman, story-teller, mountaineer and humanitarian whose life was devoted in service to others and especially his adopted country Pakistan,” the college said. Langlands, who in his lifetime was awarded two of Pakistan’s highest civilian awards, told Britain’s Telegraph newspaper in 2012 of his experience being kidnapped while working as the principal of a cadet college in the Waziristan tribal district near the Afghan border. “The military could not assault the village because we would have been killed, so they got a party of elders to approach the kidnappers. They said, ‘Look, you can’t kidnap the principal.’ So they agreed to release me,” he said. Khan — who, Langlands told the Guardian newspaper in 2009, “owes me quite a lot” — tweeted an old class photo from Aitchison when he was 12 years old. “Saddened to learn of the passing of my teacher. Apart from being our teacher, he instilled the love for trekking and our northern areas in me,” he wrote. “Pakistan has lost a great friend and a teacher of generations of its students,” tweeted British High Commissioner Thomas Drew. 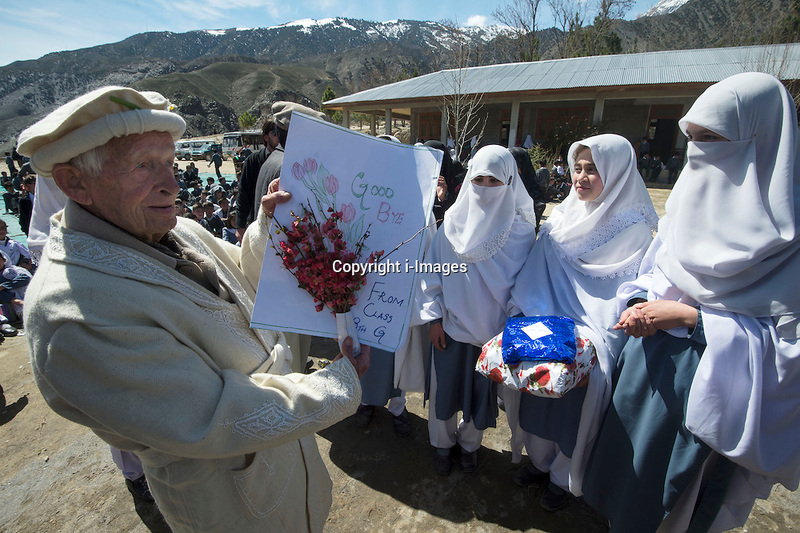 Major Langlands being presented with gifts by students who made a special cake for him at Langlands School and College in Chitral which Carey Schofield is taking over from Major Geoffrey D Langlands the former Head of as he heads off into retirement, Pakistan, 26 March, 2013. Photo by i-Images. Interesting: the way he did not get rid of his British habit of porridge for breakfast with his two cups of tea. I, as a global nomad, have also retained my Swiss habit of starting the day with ‘coffee with milk’. (google: Glimpses into the life of a global nomad part one to part ten).